Apple launched AirPods sales online yesterday, with early orders able to arrive in time for Christmas. 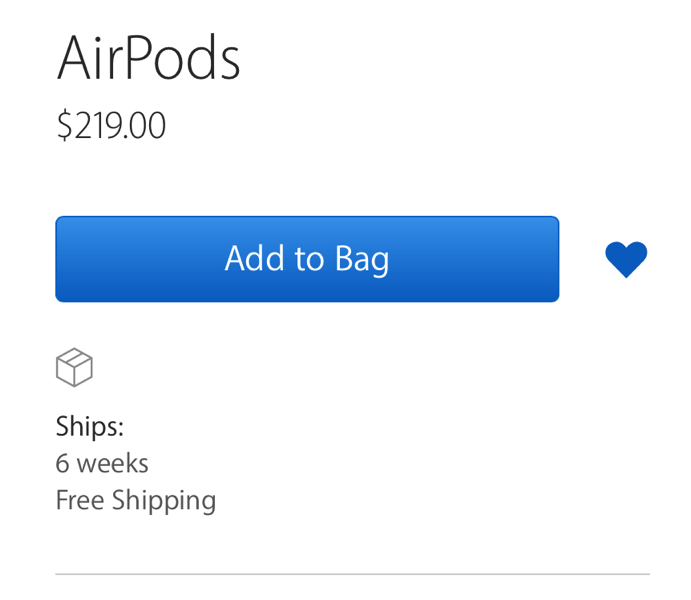 The first batch of stock quickly sold out as delivery estimates moved into late December, and as of this morning, the AirPods website says the wireless headphones are now shipping in six weeks time, which means late January 2017. If you missed out on the online sales launch, AirPods will be available in Apple Stores next week, according to Apple’s press release, which stated “stores will receive regular AirPod shipments”. Best Buy Canada will most likely sell AirPods as well, so keep checking their website. So you can still purchase them in stores if you don’t want to wait until 2017 for online orders. When are your AirPods expected to deliver? Ours are slated to arrive on Friday, December 23rd (we ordered just after 6AM PST).